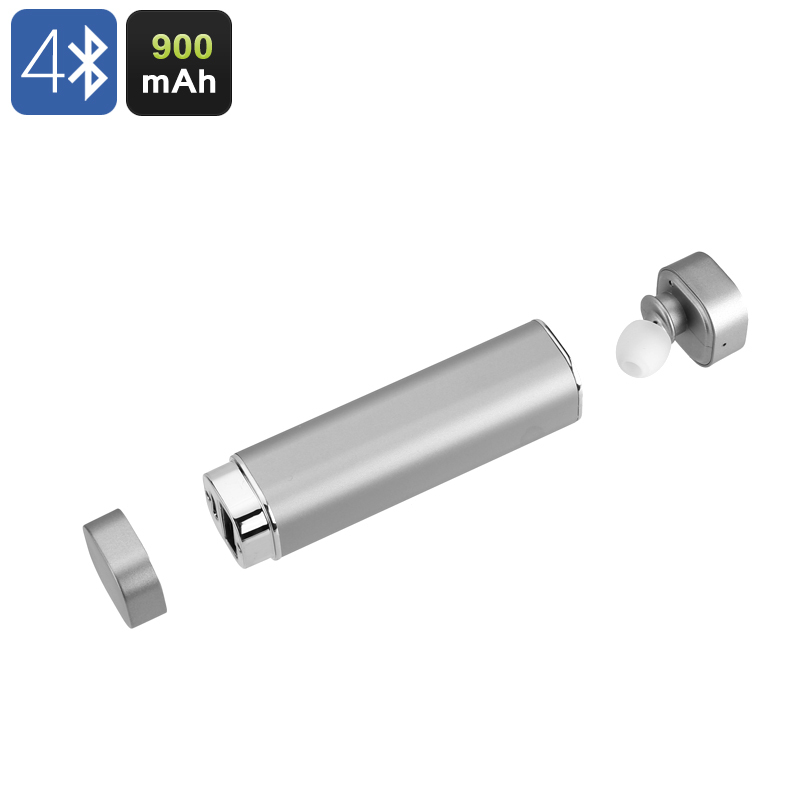 Successfully Added 2-In-1 Bluetooth Headset And Power Bank - Built-In Mic, Ear Hook Design, Aluminium Alloy, 900mAh Power Bank (Silver) to your Shopping Cart. This magnificent little device features a portable power bank and Bluetooth headset in one, making it the perfect little electronic gadget to carry along at all time. With its sleek, fashionable, and stylish aluminum alloy design this 2-in-1 Bluetooth headset and power bank is extremely portable and small in size. Featuring a built-in mic this little gadget additionally allows you to easily make hands-free phone calls with the simple touch of a button. Simply pair the Bluetooth headset to your smartphone and you will be able to listen your favorite tracks and efficiently answer phone calls at any given time. The Bluetooth ear set can be used up to 5 hours continuously – providing you with plenty of time to enjoy your music while on the road or to answer countless incoming phone calls. Featuring a 900mAh battery the portable power bank is capable of charging your headset multiple times before running out of juice – providing you with enough power to get through multiple days without needing to worry about battery life. Additionally, this 900mAh power bank can be used to recharge your smartphone and other electronic devices in case of emergency – ensuring that you will never be out of reach for your loved ones. With its lightweight and compact design this 2-in-1 Bluetooth headset and power bank is not much larger than the size of a regular lighter or lipstick, making it extremely portable and perfect to carry along within your purse or pocket. No matter where you’re headed, with this small yet powerful Bluetooth earphone and power-bank you can be assured that you’ll always be able to listen to your favorite tracks and never run out of juice again when your electronics are most needed. Thanks to a built-in mic that this ear piece features you will be able to simply answer and reject incoming phone calls by the touch of a button. No longer will there be the need to dig out your smartphone from your pocket or bag, with this Bluetooth headset you will be able to answer your calls remotely and thus be always within reach to your friends and family. A comfortable ear hook design ensures that the head set fits firmly to any size and shape of ear out there. Offering hours worth of usage time to listen to your favorite music and answer incoming phone calls while, at the same time, featuring a built-in miniature powerbank - this is the perfect little gadget to everybody that spends a lot of time on the road, likes to listen to music while exercising, and any outdoor enthusiast in general that always likes to have a little bit of extra juice at hand in case his smartphone battery is running low. This Bluetooth headset comes with a 12 months warranty, brought to you by the leader in electronic devices as well as wholesale electronic gadgets..
Arabic: - سماعة بلوتوث ومصرف الطاقة - Chinese Simplified: - 蓝牙耳机和电源银行 - Czech: - Bluetooth sluchátka a Power banka - Dutch: - Bluetooth-Headset en Power Bank - French: - Oreillette Bluetooth et Power Bank - German: - Bluetooth-Kopfhörer und Ladegerät - Hebrew: - אוזניית Bluetooth וכוח הבנק - Hindi: - ब्लूटूथ हेडसेट और पावर बैंक - Hungarian: - Bluetooth Headset és Power Bank - Italian: - Auricolare Bluetooth e la banca di potere - Japanese: - Bluetooth ヘッドセットと電源銀行 - Korean: - 블루투스 헤드셋과 전원 은행 - Malay: - Set kepala Bluetooth dan kuasa Bank - Norwegian Bokmål: - Bluetooth Headset og makt Bank - Romanian: - Setul cu cască Bluetooth şi Power Bank - Russian: - Bluetooth-гарнитура и банк питания - Spanish: - Auricular Bluetooth y Banco de potencia - Thai: - ชุดหูฟัง Bluetooth และ ธนาคาร - Turkish: - Bluetooth kulaklık ve güç banka - Vietnamese: - Tai nghe Bluetooth và Power Bank.